I f you have been to the University of Tennessee Medical Center lately, you may have seen a life-size picture of one our church members. 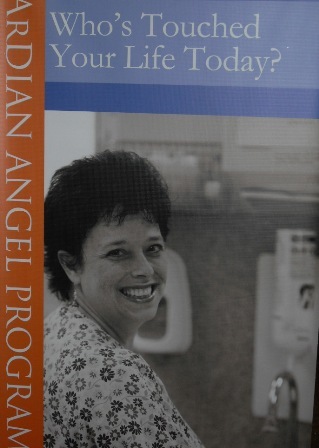 The Medical Center is using the photo of Jami Ward to promote the Medical Center’s Guardian Angel program. It has been in use for some time now. I saw it again this week. I guess I was finally over the excitement of seeing someone I know on display in such a prominent way, because I read the caption for the first time. The caption said, “Who’s touched your life today?” What a powerful question next to the face of someone who works in an intensive care unit for infants. Every day Jami touches the lives of families as she cares for what is most precious to them. As I let the caption rest in my mind, I saw another face from our church family. It was not Jami’s this time, but that of young girl who I met for the first time when she was a patient in the Neonatal Intensive Care Unit. Years later, her smile now regularly brightens our hallways at church. I thought of that little girl’s family and their amazing love for her; love so strong and so deep that it gave life to her not by chance, but by choice. Touching lives indeed. The kind of love that Jesus talked about, demonstrated with his actions and that ultimately carried him to the cross, is love like that. It is rooted in real time and touches human beings in noticeable ways. Yet, it is not confined to the moment in which it is demonstrated or to the person or persons toward which it is directed. The love of Christ has a carryover effect. When we are loved by Christ, or loved with Christ’s love by one of his followers, a residue of grace lingers in our lives. To be loved is the most basic of human needs. When we experience it, we do not soon forget. If at times we live as though we have forgotten the moments we felt loved, still the experience of it remains. In it we felt acceptance. This is different than the validation we sometimes receive for doing the things we do. No, to be loved with the love of Christ is a gift. We may long for it, yet it is not offered to us because we merit it, but because there is something in the nature of it that compels those who have experienced it to share it. Our lives are transformed by such love. As I think about Jami’s picture and the caption over it, I can easily imagine a number of other faces in our church that would fit appropriately under it. Faces that bear the names of people who are the answer to the question, “Who touched your life today?” Whether it is a formal role as teacher or caregiver, or in less formal ways as friend or neighbor, sharing the love of Christ in even a seemingly insignificant way can touch a person’s life in such a way that he or she is transformed by it, marked by it, so much so, that later in that person’s life, he or she is compelled in big ways and small ways to share that same love. Touching lives is what we do as followers of Christ. Someone, perhaps several people, touched our lives with the love of Christ; and having been touched with such love, we are compelled by that love to touch the lives of others. This entry was posted in Spiritual Formation and tagged Community, Grace, Intensive Care Unit, Jami Ward, Love, Mercy, NICU, prayer, Spiritual Formation, University of Tennessee, UT Medical Center by edsundaywinters. Bookmark the permalink.